Congratulations to Gradus, celebrating 50 years in the flooring world. Optimum Technologies, Inc. is proud to be the United Kingdom-based company’s official North American Distributor - a role we’ve held since 1989 - allowing us to distribute their impeccable flooring accessories and interior solutions to customers throughout the United States and Canada. 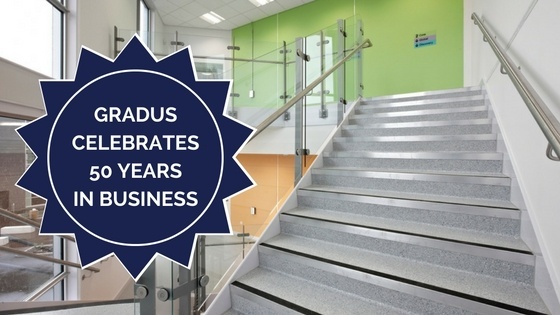 Our partnership with Gradus has been valuable for many of our customers in search of unique, high-end flooring solutions, including curved stair nosings to fit radius staircases, co-extruded transition strips, LED lighting strips, entrance matting and other high quality flooring accessories. Strategies include developing recyclable products, improving building design to increase efficiency and minimize waste, and establishing partnerships with suppliers with similar values. Optimum Technologies shares this commitment to the environment, producing non-toxic flooring solutions and recyclable products. We look forward to continuing our partnership with Gradus, and, again, congratulate the company on an impressive 50 years.